Do you ever feel God just show up for you? There’s been a few moments in my life that I look back on and know God had a plan. I think back and know now why those things happen the way they did. But have you ever been in the moment and known God was performing miracles? 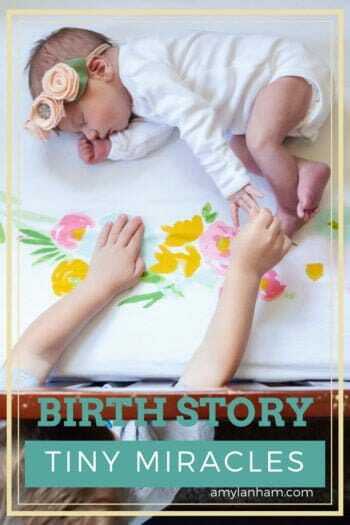 Here is Little Miss’ birth story. John and I went in for our 39 week check up on a Tuesday. My gestational diabetes had been pretty much in check up until this point through diet and exercise, and Little Miss has been head down at the last 3 appointments when they had checked me. We went in at 11 am thinking it was going to be a breeze. John almost missed that appointment. I had told him not to come. But he insisted. Everything was fine with Little Miss, but she had flipped. She was now breach. With my diabetes and it being days away from my due date they wanted me to have a C-Section. My heart literally dropped. My biggest fear after having Bugs was having Little Miss end up in the NICU. That time really took a toll on me. I wanted the ‘perfect birth’ experience. Where they take the baby and put them on your tummy and you can breastfeed naturally. After hearing C-Section, I knew that would never happen. This is our last baby, and I had to quickly come to terms with this new reality. The doctor wanted me to go straight to the hospital to have the C-Section that day, but we’d just eaten a big meal, so she scheduled us for the next day. We had to go to the hospital to check in and we finally got to go home around 3pm. We were both is complete shock, and I cried multiple times. I called my mom, a woman who had two C-Sections, in tears. I was thinking it was the end of the world, and everyone around me was so supportive. A C-Section this time around had just never crossed my mind. That night, I cuddled with Bugs, told him his sister would be arriving tomorrow and that she was so excited to meet him. I wrote them both little letters, about how anxious I was and how much I loved them both. I tried to sleep, but John and I both tossed and turned all night. The next morning we dropped Bugs off at my parents and headed to the hospital. It was a nice and relaxed morning. We arrived at the hospital at 10 am for check in for my 12pm C-Section and I was literally poop my pants terrified. The doctor had told us that she would check to see if the baby had turned right before they wheeled me into the OR. We had been texting everyone we knew, friends, family, our small group, asking them to pray for us, pray that baby flips. We had prayed multiple times. They let us know the doctor was on her way and we prayed again. At around 12:10pm the Dr came in and checked baby on the ultrasound. She had flipped! I immediately burst into tears of joy, as did John. I went from being completely terrified to elated in seconds. We said a prayer of thanks while happily embracing one another. They then took me into a birthing room and set me up on pitocin to get my labor started. After that, they started my epidural too. Once the epidural was working, they popped my water around 2 pm to keep baby wedged in place and progress my labor and we got to meet Little Miss a little after 9 pm. It was amazing and incredible. I’ve never been so happy to be in so much pain. John is the crier out of the two of us and he cried when they placed her on my belly. I was in shock and awe. I’m so thankful to God for the amazing experience and also for flipping her. I won’t lie, it makes me sad knowing what I missed with Bugs. But what matters is I have two beautiful children who are thriving. I am one blessed mama.